Almost 1,000 people were detained in more than 90 protests held across the country, as Catharina Moh reports. Turkish police have arrested more than 900 people during two days of protests, the most sustained anti-government outburst for years. Interior Minister Muammer Guler said some of those arrested had since been released, others would be put on trial. He said 26 police officers and 53 civilians had been hurt, one of them seriously. Protests flared after police cracked down on a peaceful sit-in against a plan to redevelop a park in Istanbul. The BBC's James Reynolds in Istanbul says a lot of people are fed up with the government, which they believe wants to take away some of their personal freedoms. Prime Minister Recep Tayyip Erdogan has offered to talk to the protesters, but our correspondent says there is no clear leader of the demonstrators. But witnesses said the atmosphere at dawn was calm and largely peaceful, with demonstrators milling about between burnt-out cars and gathering around fires. Our correspondent says that steady rainfall has dampened protests, and many of the demonstrators have gone home to get some rest. However, he says this has been a largely afternoon and evening protest, and that clashes may resume later in the day. Thousands of people had packed into Istanbul's Taksim Square on Saturday as the police pulled back. The initial protest had been a local dispute over plans to build on Gezi Park, near Taksim Square. But police attempted to move the demonstrators using tear gas, sparking an angry reaction that snowballed into nationwide protests. Mr Guler said more than 90 demonstrations had taken place in 48 cities. 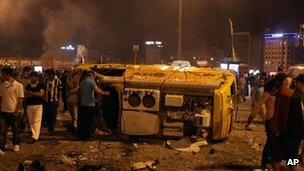 He said one of the injured civilians was being treated in an intensive care unit at an Istanbul hospital, but gave no details of how the injury was sustained. Video footage from Ankara appeared to show one protester being run down by a police vehicle. Amnesty International claimed two people had been killed and more than 1,000 injured, though there was no confirmation of those figures. Amnesty's Europe director John Dalhuisen said: "The excessively heavy-handed response to the entirely peaceful protests in Taksim has been truly disgraceful." The US also expressed concern over Turkey's handling of the protests. Mr Erdogan admitted that "there have been some mistakes, extremism in police response", but also accused his opponents of using the anger over the Gezi Park issue to stoke up tensions. The prime minister has been in power since 2002, and has indicated he will try to change the constitution to allow him to stand for another term. Some in Turkey have complained that his government is becoming increasingly authoritarian.